Our recent work on how insulin regulates the 14-3-3-interacting phosphoproteome has given unexpected insights into the evolution of cell signaling networks, which in turn provide a new conceptual framework for elucidating how signaling networks are dysregulated in diabetes, cancer and neurological disorders. We discovered that insulin stimulates the rapid phosphorylation of hundreds of specific proteins in most tissues and organs tested. The resulting phosphoproteins dock into C-shaped proteins named 14-3-3s, and can then play specialized roles in mediating diverse physiological responses to insulin: for example, certain phosphoprotein–14-3-3 complexes coordinate the uptake of glucose into skeletal muscle, others gear up the kidneys for increased urine production, and alter cardiac metabolism and contractility to regulate tissue blood flow. Interestingly, the insulin-regulated kidney and cardiac proteins that we have identified include several with known genetic links to renal and heart failure, respectively. These findings suggest that diabetic kidney and cardiac diseases may stem from genetic or biochemical faults in insulin control of regulatory proteins within these organs. Glucose need not always be the middleman. We also discovered that insulin in the bloodstream triggers rapid changes in brain proteins. This was surprising because the brain is protected by the blood-brain barrier, which prevents bloodstream insulin from entering the brain. Intriguingly, in contrast to kidneys and heart where insulin increases interactions between phosphoproteins and 14-3-3s, many brain phosphoproteins lose phosphates and can no longer dock onto 14-3-3s when blood insulin levels rise after feeding. Our working hypothesis is that insulin transmits an unknown signal across the blood-brain barrier that may decrease levels of the neurotransmitter dopamine, which in turn causes the widespread brain changes that we observe. We are investigating these brain changes in molecular detail, including how systemic insulin and 14-3-3s control a set of brain (phospho)proteins that work together to alter neuronal cell morphology. Another brain protein is translocated in and out of the cell nucleus depending on whether or not it is phosphorylated and docked onto a 14-3-3 protein. In future, we wish to collaborate with behavioural neuroscientists to define how such molecular events contribute to changes in emotions, motivation and behaviour when we eat. We are also keen to investigate whether defects in insulin control of brain proteins explains why certain people with diabetes are at risk of cognitive decline and Alzheimer’s disease. In summary, by working out the precise mechanisms by which insulin and 14-3-3 proteins influence the inner workings of the heart, brain and other organs we hope and expect to bring new understanding of the diverse manifestations of diabetes. Glucose control is only part of the picture. Left: ZNRF2 is an E3 ubiquitin ligase with an N-terminal myristoyl moiety that interacts with intracellular membranes. On membranes, the RING domain of ZßNRF2 participates in ubiquitylation of certain ion pumps, thereby influencing cellular ion balance and nutrient sensing. Right: In response to insulin, IGF1 and other stimuli, ZNRF2 is phosphorylated by various kinases, and phosphoSer19 and phosphoSer82 dock onto a 14-3-3 dimer. Our data indicate that 14-3-3 binding causes a disorder-to-order transition in ZNRF2, creating a pocket for the N-myristoyl group to tuck into. Therefore, insulin and IGF1 cause the protein to dissociate from membranes into the cytosol. Remarkably, around 90% of the insulin-regulated 14-3-3-binding phosphoproteins that we have identified are ‘ohnologues’, which means that they belong to protein families that were generated by two rounds of whole genome duplication (2R-WGD) at the evolutionary origin of the vertebrates. These 14-3-3-regulated ohnologue phosphoproteins include many signaling proteins such as protein kinases, regulators of small GTPases, ubiquitin ligases, cytoskeletal regulators, and transcription factors. This means that a boost to the 14-3-3–interactome, and cell signaling in general, was fundamental to evolution of the vertebrate animals, which has all sorts of practical and conceptual implications. 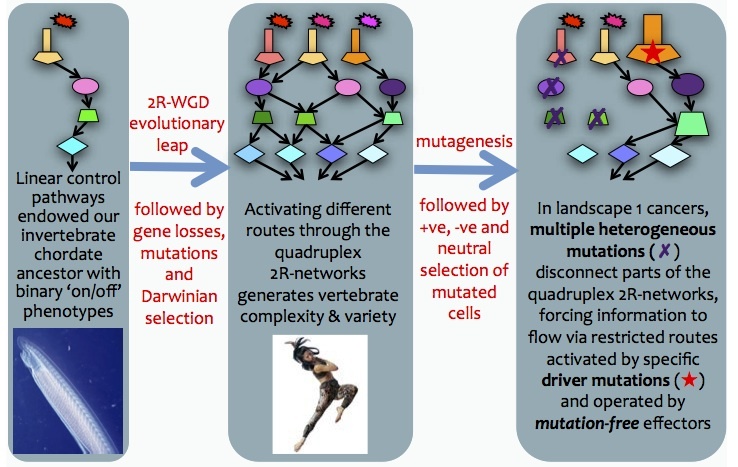 Based on our biochemical data, we propose that the simple linear signaling pathways in the invertebrates were converted via the 2R-WGD into multi-stranded parallelised networks. Different combinations of sister ohnologues in these networks are co-regulated under different condition. For example, one set of ohnologues is phosphorylated and captured by 14-3-3s in cells stimulated by insulin, whereas their sister ohnologues have evolved 14-3-3-binding phosphosites that are phosphorylated when cells are energy stressed, or stimulated by adrenalin and growth factors. In principle, such networks can respond to a wide array of environmental, sensory and hormonal stimuli and integrate them to generate phenotypic variety in cell types and behaviours. Patterns are also being discerned in how the vertebrate signaling networks are reconfigured in human cancers and neurological conditions. For example Figure 2 shows a hypothesis generated from our recent analysis of mutations in multiple cancer genomes. Together, these recent findings have opened up exciting new projects in my lab, combining biochemical dissections of regulatory mechanisms, disease bioinformatics and evolutionary approaches. It is fascinating to unpick how ancient genomic events impact on complexity, variety and disease in modern life. MacKintosh, C. and Ferrier, D. E. K. (2017) Recent advances in understanding the roles of whole genome duplications in evolution. F1000Research. 6, 1623. Chen Q, Xie B, Zhu S, Rong P, Sheng Y, Ducommun S, Chen L, Quan C, Li M, Sakamoto K, MacKintosh C, Chen S, Wang HY. A. (2016) Tbc1d1 (Ser231Ala)-knockin mutation partially impairs AICAR- but not exercise-induced muscle glucose uptake in mice. Diabetologia. 2016 Nov 8. Chen L, Chen Q, Xie B, Quan C, Sheng Y, Zhu S, Rong P, Zhou S, Sakamoto K, MacKintosh C, Wang HY, Chen S. (2016) Disruption of the AMPK-TBC1D1 nexus increases lipogenic gene expression and causes obesity in mice via promoting IGF1 secretion. Proc Natl Acad Sci U S A. (2016) Jun 28;113(26):7219-24. Epub 2016 Jun 15. Li, M., Quan, C., Toth, R., Campbell, D.G., MacKintosh, C., Wang, H.Y. and Chen, S. (2015) Fasting and systemic insulin signalling regulate phosphorylation of brain proteins that modulate cell morphology adn link to neurolgical disorders. The Journal of biological chemistry. 290, 30030.30041. Madeira, F., Tinti, M., Murugesan, G., Cole, C., Berrett, E., MacKintosh, C. and Barton, G. J. (2015) 14-3-3-Pred: Improved methods to predict 14-3-3-binding phosphopeptides. Bioinformatics 2015. Ohman T, Soderholm S, Hintsanen P, Valimaki E, Lietzen N, MacKintosh C, Aittokallio T, Matikainen S, Nyman TA. (2014) Phosphoproteomics Combined with Quantitative 14-3-3-affinity Capture Identifies SIRT1 and RAI as Novel Regulators of Cytosolic dsRNA Recognition Pathway. Mol Cell Proteomics. 2014 Jul 5. Tinti M, Dissanayake K, Synowsky S, Albergante L, MacKintosh C. (2014) Identification of 2R-ohnologue gene families displaying the same mutation-load skew in multiple cancers. Open Biol 4, 140029. Chen Q, Quan C, Xie B, Chen L, Zhou S, Toth R, Campbell DG, Lu S, Shirakawa R, Horiuchi H, Li C, Yang Z, MacKintosh C, Wang HY, Chen S. (2014) GARNL1, a major RalGAP α subunit in skeletal muscle, regulates insulin-stimulated RalA activation and GLUT4 trafficking via interaction with 14-3-3 proteins. Cellular Signalling 26, 1636-1648. Tinti M, Madeira F, Murugesan G, Hoxhaj G, Toth R, MacKintosh C. (2014) ANIA: ANnotation and Integrated Analysis of the 14-3-3 interactome. Oxford Journals. Wang, H.Y., Xie, B., Quan, C., Chen, Q., Chen, L., Sakamoto, K., MacKintosh, C., and Chen, S. (2013) Filling hte GAPs in GLUT4 trafficking. Hoxhaj G, Dissanayake K, MacKintosh C. (2013) Effect of IRS4 Levels on PI 3-Kinase Signalling. PLoS One. 8, e73327. 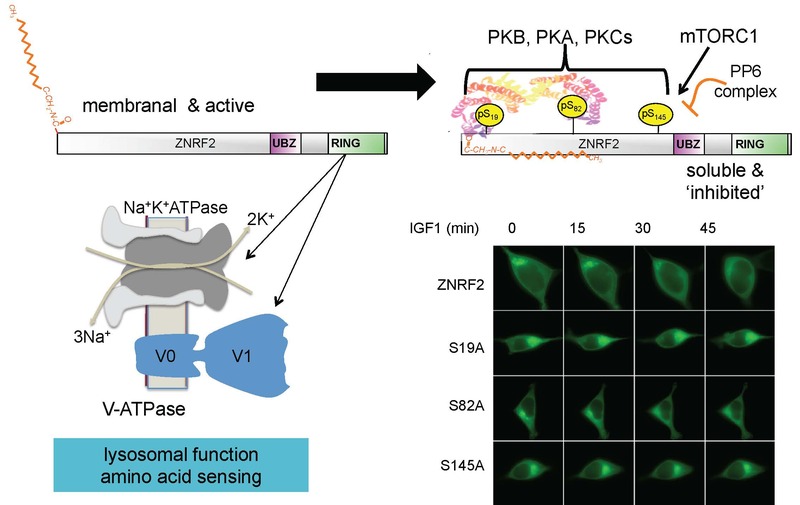 Hoxhaj G, Najafov A, Toth R, Campbell DG, Prescott AR, MacKintosh C. (2012) ZNRF2 is released from membranes by growth factors and with ZNRF1 regulates the Na+/K+ATPase. J Cell Sci 125, 4662-4675. Tinti M, Johnson C, Toth R, Ferrier DEK, MacKintosh C. (2012) Evolution of signal multiplexing by 14-3-3-binding 2R-ohnologue protein families in the vertebrates. Open Biol 2, 120103. Neukamm SS, Toth R, Morrice NA, Campbell DG, MacKintosh C, Lehmann R, Häring H-U, Schleicher ED, Weigert C. (2012) Identification of the aminoacids 300-600 of IRS-2 as a 14-3-3 binding region with the importance of IGF-1/insulin regulated phosphorylation of Ser-573. PLoS ONE 7, e43296. Ducommun S, Wang HY, Sakamoto K, MacKintosh C, Chen S. (2012) Thr649Ala-AS160 knock-in mutation does not impair contraction/AICAR-induced glucose transport in mouse muscle. Am J Physiol Endocrinol Metab 302, E1036-1043. Chen S, Synowsky S, Tinti M, MacKintosh C. (2011) The capture of phosphoproteins by 14-3-3 proteins mediates actions of insulin. Trends Endocrinol Metab. 22, 429-436. Johnson C, Tinti M, Wood NT, Campbell DG, Toth R, Dubois F, Geraghty KM, Wong BHC, Brown LJ, Tyler J, Gernez A, Chen S, Synowsky S, MacKintosh C. (2011) Visualization and biochemical analyses of the emerging mammalian 14-3-3-phosphoproteome. Mol Cell Proteomics. Chen S, Wasserman DH, MacKintosh C, Sakamoto K. (2011) Mice with Thr649Ala-TBC1D4(AS160) knock-in mutation are insulin resistant with impaired glucose tolerance and altered GLUT4 trafficking. Cell Metab 13, 68-79. Pozuelo Rubio M, Leslie NR, Murphy J, MacKintosh C. (2010) Mechanism of activation of PKB/Akt by the protein phosphatase inhibitor calyculin A. Cell Biochem Biophys 58, 147-156. Johnson C, Crowther S, Stafford M, Campbell DG, Toth R, MacKintosh, C. (2010) Bioinformatic and experimental survey of 14-3-3 binding sites. Biochem J 427, 69-78. Chen S, MacKintosh C. (2009) Differential regulation of NHE1 phosphorylation and glucose uptake by inhibitors of the ERK pathway and p90RSK in 3T3-L1 adipocytes. Cell Signal 21, 1984-1993. Dubois F, Vandermoere F, Gernez A, Murphy J, Toth R, Chen S, Geraghty KM, Morrice NA, MacKintosh C. (2009) Differential 14-3-3-affinity capture reveals new downstream targets of PI 3-kinase signalling. Molecular Cell Proteomics 8, 2487-2499. Pehmøller C, Treebak JT, Birk JB, Chen S, MacKintosh C, Hardie DG, Richter EA, Wojtaszewski J. (2009) Genetic disruption of AMPK signaling abolishes both contraction- and insulin-stimulated TBC1D1 phosphorylation and 14-3-3 binding in mouse skeletal muscle. Am J Physiol 297, E665-675. Hunter RW, MacKintosh C, Hers I. (2009) Protein kinase C-mediated phosphorylation and activation of PDE3A regulates cAMP levels in human platelets. J Biol Chem 284, 12339-12348. Treebak JT, Frøsig C, Pehmøller C, Chen S, Maarbjerg SJ, Brandt N, MacKintosh C, Zierath JR, Hardie DG, Kiens B, Richter EA, Wojtaszewski, JFP. (2009) Potential role of TBC1D4 in enhanced post-exercise insulin sensitivity in human skeletal muscle. Diabetologia 52, 891-900. Wood NT, Meek DW, MacKintosh, C. (2009) 14-3-3 binding to Pim-phosphorylated Ser166 and Ser186 of human Mdm2 – potential interplay with the PKB/Akt pathway and p14ARF. FEBS Lett 583, 615-620. Chen S, Murphy J, Toth R, Campbell DG, Morrice NA, MacKintosh C. (2008) Complementary regulation of TBC1D1 and AS160 by growth factors, insulin and AMPK activators. Biochem J 409, 449-459.